The multi-purpose room at the Jewish Day School was crisp and clean and smelled faintly of paint, with a large U-shaped table set with white tablecloths and flowers. As the middle schoolers filed in that Tuesday morning wearing T-shirts of their own design, teachers Dana and Nati Kind poured small glasses of grape juice and distributed haggadot that were created by the students. Meanwhile, 5,000 miles away in the Yoav Regional Council in Israel, students were returning to their school campus in the early evening to get ready for their seder. They too had tables set, T-shirts on and homemade haggadot at the ready. Then two seders on opposite sides of the world came together. 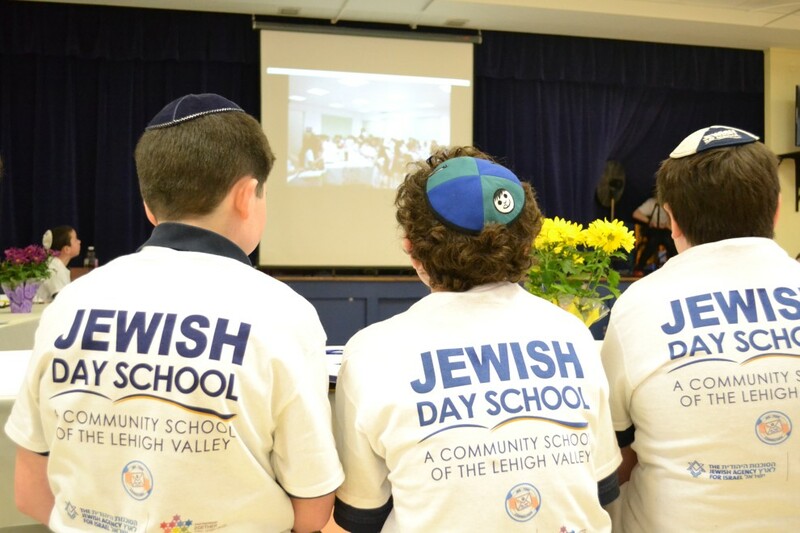 They were connected on a large screen via Skype and the seder began with a L'Chaim (over grape juice) to celebrate the partnership between the two schools. "This is the second year of our partnership with Yoav," said Dana Kind as she started the seder. "Last year we had 20 students at JDS and 22 in Israel. This year, we have 32 students and 43 in Israel." The principal of the school in Yoav also addressed the students in Hebrew, while Dana Kind translated. She thanked the teachers for all their hard work and remarked on the special connection between the schools. Reading from their haggadot, the students discussed the unique Passover traditions they celebrate at their own family seders, addressed their thoughts on topics such as freedom versus comfort, acted out a skit and sang songs together. The JDS students often spoke in Hebrew and the Yoav students made remarks in English, allowing for both schools to show off their foreign language skills. "In the twinning efforts of Partnership2Gether, our teachers have created a curriculum where our kids learn together, and most importantly, interact with each other," said Aaron Gorodzinsky, director of outreach and community relations for the Jewish Federation, which oversees the partnership. "They now see each other as a family, so, in the future, when our kids visit Israel, the first place they will want to visit is Yoav." The seder ended with an emphatic "L'Shana Haba Beyerushalim!"